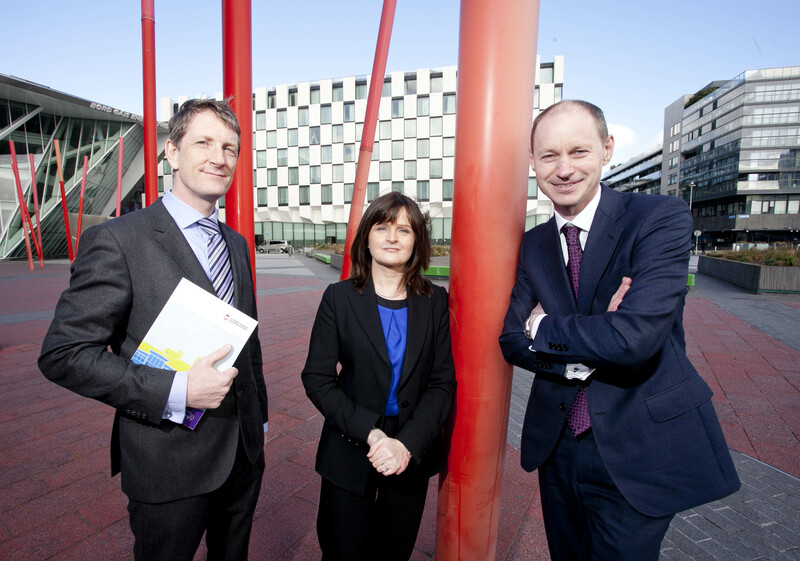 Pictured at the launch of the SCSI Annual Commercial Property Outlook & Review 2014 (L-R): Eamonn Maguire, SCSI Commercial Agency Professional Group Chair; Pauline Daly, SCSI Vice-President; and, Ray Hanley, SCSI Valuation Professional Group Chair. Thursday 27th March 2014.A new report on the commercial property market shows that there was a turnaround in the commercial market in 2013 and that this has continued in the first quarter of 2014. According to the report there was a 23% increase in take-up in the office market in 2013 and prime office rents have increased by up to 10% over the first three months of 2014 driven by strong demand from Foreign Direct Investment companies. The Society of Chartered Surveyors Ireland (SCSI) Commercial Property Review and Outlook 2014, suggests that prime office rents in Dublin are now priced between €350-€377 per sq metre and that the vacancy rate in Dublin City Centre is around 9%, with 7-8% considered a shortage. A survey of 400 Chartered Surveyors formed the key part of the SCSI report, which was published in conjunction with Amárach Research. Sixty six per cent of those surveyed said they expected the supply of prime office space in Dublin to decrease over the next 12 months while three out of four said they expected rents for these properties to rise. The report also highlights concerns over shortages of modern office space in Cork and Galway and says these may threaten the country’s ability to continue to attract Foreign Direct Investment. Eamonn Maguire, Chair of the SCSI Commercial Agency Professional Group said the office market has been the star performer over the past 12 -14 months. “While the turnaround is most welcome it is paramount that we address supply issues. At the moment we are seeing the effects of the lack of construction over the past 4 to 5 years and this together with increased international investment and demand, is leading to a tightening of supply for modern office space in the major cities. “This shortage is leading to increased rents and a declining vacancy rate and measures must be put in place to ensure that this does not threaten our competitiveness in terms of attracting Foreign Direct Investment. The current demand is largely driven by multi-national organisations in the Telecoms, Media and Technology sectors and these increasingly mobile firms cannot afford to wait 24 months for projects to get off the ground”. “Ensuring the availability of development finance for measured speculative development, introducing fast track planning in strategic areas and speeding up the Docklands SDZ will we believe address the supply issue while also supporting job creation” he said. Mr Maguire pointed out that a comparison between the office sector and the residential market was apt. ”Currently we have a shortage of supply of particular residential property types in certain urban areas due to a lack of construction and the availability of finance for developers and prospective buyers. The same situation applies to office space” he said. The SCSI report also suggested that a two tier commercial office market is emerging and that offices outside of the major cities and in regional areas continue to struggle. In the retail sector, rents for prime rental in Dublin continued to fall in 2013 and are now just above €4,000 per sq. m. However 75% of surveyors do not expect an increase in the supply of prime retail in the city and this should see rents stabilise. Rents for prime retail increased in Leinster and are now at €325 per sq m. an increase of 7.3% while they also increased across most retail categories in Connacht and Ulster. However rents continued to fall in Munster reflecting tough trading conditions in Cork, Limerick and Waterford. “The retail space sector was badly hit over the past number of years, largely reflecting the economic challenges faced by the country. It is too early to predict a recovery in this sector and there are regional retail schemes around the country which are struggling but we are seeing a stabilisation in rents in the better locations” Maguire said. The SCSI report suggested that rents for prime industrial rents in Dublin have also begun to stabilise at €61 per sq m. largely driven by demand from online distribution and data centres and the food sectors. Investment in the commercial property market accelerated to around €2bn in 2013, three times higher than 2012 and that pace of investment looks set to continue in 2014. According to the report, over half of investment spend in 2013 came from international investors with strong demand from the US, Europe and Asia. “The growth in the investment market was largely driven by the office market and the extension of the Capital Gains Tax relief in the last Budget and the introduction of the Green and Hibernia REITs have further improved investor sentiment and liquidity in the market” said Maguire. Hotels and restaurants in Dublin registered increases in capital values in 2013 reflecting a higher volume of transactions in 2013 than had been anticipated. However declining values are still evident in pubs and restaurants outside Dublin, though improvements are apparent in Connacht/Ulster. Non-agricultural land sales were up four fold between 2012 and 2014 which was largely driven by demand for development sites for residential house building and commercial development. The SCSI said that the introduction of the Commercial Lease Register represented a significant improvement in transparency in the sector around leases. “This was a welcome development and we are calling for a Commercial Transaction Database, like the Residential Property Price Register to be introduced as soon as possible. It’s the next logical step and will bring an added level of transparency to the sector for tenants, occupiers, landlords as well as supporting more international investment” concluded Maguire. This report, which was compiled by Amárach Research in conjunction with the Society of Chartered Surveyors Ireland (SCSI) and is based on three pillars of research. An online survey of 400 Chartered Surveyors to determine average rents and yields, expectations of rents and supply issues forms the core basis of the Report. As well as collating the findings, Amárach Research conducted in-depth interviews with SCSI Chairs and leading industry experts who impact on the sector to capture their views on the opportunities and challenges in the commercial property market. In addition Amárach Research conducted secondary research on the economic context and the Commercial property market in general.